Soccer, also known as football, is hugely popular and millions of people around the world enjoy watching local and international events. In the US and Canada, the most important soccer event is the Major League Soccer season. Large networks are now working to cover the event and to offer regular programming schedules. This will allow fans to stay up to date with everything that happens in the world of MLS. It also shows that the popularity of soccer in the United States continues growing. 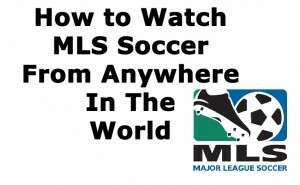 Major League Soccer can be watched online through WatchESPN, but they are only available for viewers in the US. The good news is that if you live outside the United States and don’t want to miss a match, you can rely on a VPN to enjoy the MLS season. With a VPN you can change your IP address to appear as if you were connecting from within the US. VPNs offer many advantages for internet users, including security and flexibility. Apart from protecting your connection snd ensuring that your emails and online conversations are safe from eavesdroppers, a VPN can also help you to bypass geo-location restrictions. By changing your IP address, you can access services that are not available in your country, like ESPN’s online streaming of the MLS matches. There is a wide selection of VPN services, but they all work in a similar way. Some of the best VPN providers have developed their own software and applications that work with main platforms like Windows, OS X, Linux, Android and iOS. After downloading and installing the VPN software, you will be able to select a server location once the client is launched. In order to watch the MLS games, you will need to select a server in the United States. VPNs support multiple protocols that secure your connection, but OpenVPN is the most reliable option. It allows you to stream content online, while keeping your privacy protected. Once you connect to the server of your choice, your IP will changed an your online location will be set in the United States. With a VPN you can watch content that is only available in a specific country by connecting to a server that is located there. This is why it’s such a convenient option to enjoy services like Hulu (US) or BBC iPlayer (UK). You can even access content from Netflix that is blocked in your country. Major League Soccer fans who live outside the US, or who need to travel during the season, can still be part of all the action thanks to a VPN. Now that you know how a VPN can help you to watch the 2015 MLS, you need to choose a provider that offers high security, advanced features and great speed. Finding the right service will depend on your specific needs, but any of the below VPNs would be a great solution for enjoying content that is only available for users in the United States. IPVanish is one of the leading solutions in the VPN industry due to their commitment to offering customers security and freedom to enjoy the best online content, no matter where they live. The fact that they manage their own network of servers, means that they can offer impressive speeds and a reliable service. IPVanish has over 40 servers in the United States, in locations like Atlanta, Miami, New York, Chicago and Los Angeles. One month of service is priced at $10 USD, but to get the best value for money you can subscribe for a longer period of time, which reduces the monthly cost. One of the main things that you need when you want to stream online content effectively is good speed. VPNs tend to slowdown your internet connection since they encrypt it. However, the best services can reduce the impact on your online experience, ensuring that you can watch videos, movies and sport events without any issues. Private Internet Access or PIA, is recognized as a great option for anyone who wants to enjoy content online. PIA offers security, speed and servers in Texas, Florida, California and more. Affordability is another strong point as one month of service would only cost you $6.95. PureVPN offers top technology and it is also very easy to use. Since it performs very well in terms of speed, it is an ideal option for watching the MLS matches. PureVPN operates its own network of servers and it offers thousands of IP addresses in the United States. Apart from being a top solution for unlocking geo-restricted content, PureVPN stands our for supporting a high level of encryption. The price for one month of service is $9.95, but you can subscribe for 12 months and pay just $49.95 (only $4.16 per month), which will allow you watch the 2015 MLS season online from anywhere in the world.